We were forced to be patient early this week, as east and northeast winds swirled around Hurricane Maria, which parked itself offshore for a few days. But everything changed on Thursday, when the winds switched around to come from the northwest. Monarch numbers steadily increased on Thursday, but Friday brought the year's first really big flights. All day long we watched monarchs dropping into Cape May Point from the sky, stopping to feed in gardens, amongst ivy vines, and especially along the dunes, where the Seaside Goldenrod has just started blooming. As we watched monarch numbers build all day, we started to anticipate monarch roosting in the late afternoon. When the temperatures start to get chilly, and when lots of monarchs are around, they'll cluster together in the late afternoon, reminiscent of the way they cluster together by the millions in their Mexican wintering areas. By late afternoon we started searching, and we found a number of areas where a few hundred monarchs we forming roosts. One of the biggest roosts was found in the pine trees along the pathway to the beach by the St. Peter's chapel, where Harvard, Ocean, and Lake streets meet. Roosts were also found by the corner of Cape & Lincoln, and also along Alexander Ave.
We were delighted by a visit from Ted Greenberg of Philadelphia's NBC-10 television station, who filmed and produced a short segment on the monarchs of Cape May Point, which you can see here: http://www.nbcphiladelphia.com/news/local/Butterflies-Flock-to-Jersey-Shore_Philadelphia-448715873.html. The forecast suggests that monarchs will continue to migrate through Cape May Point in good numbers on Saturday and possibly also on Sunday. 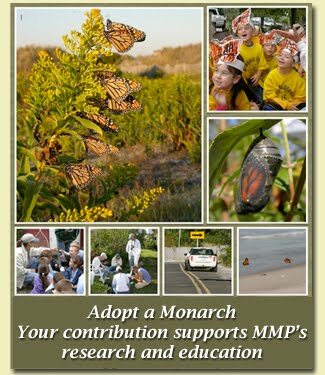 If you come to Cape May to see the monarchs this weekend, we hope you'll come to one of our Monarch Talks and Tagging Demos, which are held at the East Shelter of Cape May Point State Park at 2:00 pm on Fridays, Saturdays, and Sundays through October 15. Great stuff. Wish I was there.